When one of the world's legendary performance artists -- Oleg Kulik -- collaborates with a visionary entrepreneur-philosopher -- Dmitry Volkov -- the audience rightly expects an intellectual blockbuster. The Brooklyn Academy of Music (BAM) is presenting "OraculeTang," their startling and fascinating installation "in the form of a giant robotic ape, which combines contemporary art with modern technology and offers an interactive experience involving the audience" tonight. This new work is part of BAM's venerable Next Wave Festival that built its reputation since its inception in 1983 and is rightfully considered New York's most comprehensive and daring survey of forms of avant garde in art and music. Oleg Kulik made his name with shocking, provocative performance art with an animal twist and, more recently, moved to "the spiritual man." Born in 1961 in Kiev, he attended art school and moved to Moscow in 1986. He came to prominence shortly after the collapse of the Soviet Union for his controversial performance art and visual installation and more recently for his work about the body and representation. Arguably his most known performances were variations of his "dog" performances, such as "I Love America, but America doesn't love me," with him acting like a dog, walking on all fours wearing a dog collar and a leash, naked, biting and barking at people, as well as "Deep into Russia," criticizing contemporary society in the guise of an animal. Roberta Smith once wrote that Kulik's art is not a Conceptual exercise, the kind "that you can "get" if someone simply describes it to you. [...] [D]irect experience of it is required and [...] it uses illusion to make us think more deeply about reality." This remains true for "OraculeTang," which Kulik developed together with Dmitry Volkov. In a far-ranging conversation Volkow shared how the two became collaborators and how life's twists and turns brought him to push the boundaries of interactive performance art and artificial intelligence. The two men met through a mutual friend over tea and a conversation about art. Volkov recalls about their first encounter that he thought that Kulik was really interesting and filled with ideas although he found some of what the artist said a bit confused. But intrigued and intellectually curious he got interested in figuring out more about the artist's way of thinking. Their first joint project was dedicated to proof of the existence of the external world, involving table tennis, a philosophical essay being read every time the ball dropped on the floor, leaving the audience reportedly fascinated. "Since then we had a good relationship and collaborated. In general he is more interested in emotional impact while I'm interested in the ideas ... A good combination," Volkov added. How did Volkov get to the point where he not only headed an international software and engineering company but also became involved in philosophy and eventually performance and installation art? "My interests are not always directly connected," he explains. Contemporary art is often an inspiration for me and for my colleagues at SDV. We try to build an innovative technological business. And art helps to think outside the box, be inspired, feel astonishment by the world. It encourages you to look for new ways in business and technology, seek new perspectives. In some aspects philosophy is also like that too. He admits that philosophy is like a second life for him. I'm the founder and the co-director of the Moscow Center for Consciousness. We sponsor research and the exchange of philosophical and scientific ideas. In general I think it is very natural to reflect on the most fundamental questions. Most kids try to understand the world better and think about these big issues. But as they grow up work, and different routine concerns often displace this interest. Or maybe some feel that no progress can be made in these areas. I'm more optimistic about that. And I'm happy to be able to afford time to do philosophy. My main interests are mind-body problem and free will [...]. I'm very impressed by work done by [Daniel] Dennett, [David] Chalmers, [Derk] Pereboom, [John Martin] Fischer, [Paul] Churchland and my advisor [Vadim] Vasilyev. They do cutting-edge philosophy. Joining them for a ride gives intellectual pleasure and also helps to get more meaning in life. He then adds with a smile: "I think they are sometimes wrong, too. And when they are it is interesting to see where their theories can be improved. Volkov's artistic inclination as well as his business acumen, however, had come a long a long way and were in fact inextricably linked: "I was always in interested in arts. In fact my career started more like the career of an actor rather than a business person. At 12 years old I danced on Broadway for a month in the musical "The Shooting of Dan McGrew." At 14 I was starring in the Russian action movie "The Red Mob." Not bad, young Mr. Volkov. He then performed with a youth theatre for several years and practiced classical piano. A lot of people thought he was on his way to some art school. "But this perspective didn't look satisfying to me back then," he adds matter-of-factly, describing this turn of events. "I was interested in entrepreneurship," he continues. During the school years my friend and I started a recruitment agency for youth. We were 14 and thought we found a 'blue ocean.' Guess what: most teenagers didn't have jobs. And we thought we can help them to get hired. When the Soviet Union collapsed everybody had wild business ideas. So did we. We didn't really understand that employment of teenagers is in the grey area. Maybe it was even illegal. But we didn't have problem with the government. Russia was a 'laissez-faire' country at that time. We had some successful projects with the agency. The problems came from another authority. It was the school. Home assignments took over. We were school kids and really couldn't be managing the business. Reality had caught up with the budding entrepreneurs. I was also deeply fascinated by computer technology and software. So still being at the university I decided to start an IT company. And gradually we found a proper niche. We started investing in new technology for communication and developing new ways for people to socialize and meet each other online. That's what Social Discovery Ventures do. We build technology and invest in companies in the social discovery industry ... Now I feel like I can devote a bit more time to my creative hobbies. Although the mission in business is still far from being over. It is not a surprise that the late Nam June Paik is among the artists that inspire Volkov. He is considered the founder of video and a pivotal figure in the history of modern art and recently received a major retrospective at The Asia Society Museum. He managed to find a new medium for art. I like his way of combining image and sound, technology and art. And we recently acquired an a piece by Dmitry Morozov. It is an electronic instrument that uses the bitcoin exchange rates to create various sounds. As a company we are supporting young Russian artists and collecting their work, in particular work by Irina Korina and Julia Kosulnikova. Volkov's and Kulik's collaborative project "OraculeTang" that is coming to BAM tonight was first presented at Burning Man 2015. What challenges, technological and otherwise had to be overcome? "Well, we say "OraculeTang" was born in the desert. Seeing him first in that desert landscape, lonely, in his cage beating his drum and mumbling mantras was a very special experience. The dust and clay made him look like an ancient prisoner. And also a prophet. You see, prophets often come out of deserts or mountains. So I think it was the right environment for the first presentation. And it also created room for interpretation. Oleg wanted "OraculeTang" be more like a mad prophet. And I wanted him to be more like the mad scientist, an anthropologist." The desert was a very challenging environment. We had difficulties bringing him over to the United States. I think the custom officers were suspicious of this heavy cargo that looked like a disassembled missile. We were almost late for the festival with the delivery. It was also extremely difficult to put him up in the heat and dust. This was a great challenge for our team. Then the electrical motors would get so dusty they wouldn't work. After working on the project for a few days some of us felt exhausted and nearly overwhelmed by the task and the arid environment. But overall it went well. Better than what we expected. People on bikes dressed up as settlers on Mars stopped by at night and talked to "OraculeTang." They thought he was amazing and knew something esoteric. As its creators we found this a very rewarding experience. After the desert with its Burners the installation has now landed at BAM with its edgy and discerning New York audience. Did you find them or did they find you? We reached out to BAM and they were immediately responsive. I think there's no better place than New York City to reach the kind of audience who will get a kick out of this kind of work. It does require a viewer who is thoughtful and goes beyond the Highlights-Tour' of a museum. We engage the audience and demand that the viewer really think about what he or she is experiencing. And New York City's art lovers are incredibly knowledgeable, so we think they'll get what we're trying to say. The project lives both online (Facebook) and offline, and we plan further project development also in Russia and even discussing an idea of a theatrical run for "OraculeTang." When asked about the bilateral relations of the two countries he knows best he responds: "In my international business dealings as well as in my other projects I try to create a bridge, in particular between the United States and Russia. And I think more people should be doing so as well: We should create more bridges. The world is actually one little place. And if something bad happens in one area it will be sensed everywhere else. Volkov takes a dim view of politics: "I'm not involved with politics. Politics is sometimes about capturing power for the sake of having more power. I don't see power as an intrinsic value. It can only be a temporary means to do something of value. It seems that professional, full-time politicians focus on the process and don't have time to create real value." Is there a message in "OraculeTang" that would extend to the social, cultural and/or political spheres? I think "OraсuleTang" can communicate some important political ideas. He can communicate the idea that freedom is a matter of perspective, a relative phenomenon. For example, people living in one country may look at people living in another country and see them as being oppressed. 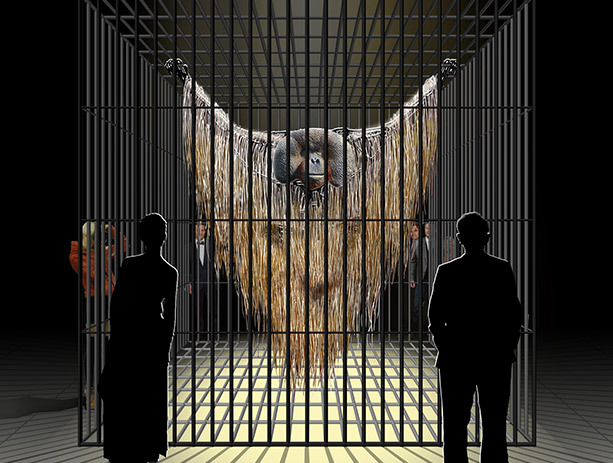 However, they themselves might see themselves as totally free.The gigantic robotic monkey is sitting in the cage. He is perceived by public as being imprisoned. He also seems to be a machine and in most people's mind machine can't be free. But "OraculeTang" himself sees the world as being imprisoned. He sees us as being organic machines. But in addition we are also confused about our mechanistic nature because our pulleys and levers are covered by skin. What's next for Volkov, as entrepreneur and artist/artistic collaborator of Oleg Kulik? "Oh, we are thinking of making a theatre performance with "OraculeTang," maybe an experimental movie. There are a lot of business projects where we have an interest. This includes augmented reality, professional social networks and blockchain technology. For an interested observer, Kulik and Volkov achieve a surprising impact with "OraculeTang:" Like all performance and installation art, they change the paradigm from a commodified object to an interactive, participatory shared experience of creative expression. They make us consider the intersection of true and simulated human intellectual, cognitive capabilities. "OraculeTang" is far more advanced than a great majority of other artificial intelligence in that it can offer, in the Volkov's words, "a level of reasoning and reaction based upon 'input' in the traditional sense, be that by coding and from direct human manipulation, or by reactive input of spontaneous simulation and data." "OraculeTang" interacts with people through scanning their reaction for moods and motions and responds with its own set of 'moods.' It is the achievement of its creators and their team that that the robot ape examines the world and reacts to an observed stimulus all the while it can't reason and react like a human.